Bradd Robert Hinton, longtime Seminole County resident, passed away Sunday, April 7, 2019 at OU Medical Center in Oklahoma City at the age of 48. Bradd was born November 18, 1970 in Mullen, Nebraska to Jeff Hinton and Gloria (Phillips) Hinton. He attended Hyannis High School in Hyannis, Nebraska. Bradd was a truck driver for many years. Recently, he started his own business which he was very proud of, Double D Connections. He married Christie Walker on March 3, 1995 in Arkansas. 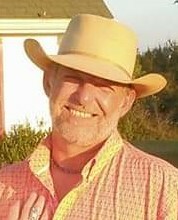 Bradd enjoyed doing all types of leather work, riding motorcycles, taking care of cattle especially horses, listening to country music, spending time outdoors, spending time with his friends and big-rig semis. He loved talking and carrying on conversations with people and just staying busy doing things. He also was a great competitor and was always looking to engage in a competition of any sort. Bradd is survived by his wife, Christie; his mother, Gloria Hinton; four sons, London Ray Waller, Gustus Lane Hinton, Jacob Verl Hinton and Kolton Robert Hinton; two brothers, Brett Hinton and Bartt Hinton; sister, Tena Burch; mother-in-law and father-in-law, Martha and David Carter; father-in-law, Verl Mathews; two brothers-in-law, John Lofton and Terry Joe Lofton; sister-in-law, Becky Ortiz; numerous nieces, nephews and a host of other family and friends. He was preceded in death by his father, Jeff Hinton. Memorial services will be held on Saturday, April 13, 2109 at 4:00 PM at Bowlegs Assembly of God with Rev. Willie Williams and Rev. Ed George, officiating.